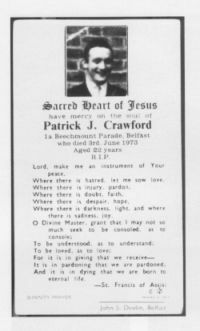 Ed Moloney has written a very moving piece on the death of Patrick Joe Crawford. Included in this post on his site at 'The Broken Elbow' is also a beautiful song written and sung by Belfast artist Dave Thompson. I hope you will take some time to go read and listen and think about this. "Accused of informing but denied the opportunity to defend himself, Paddy Joe Crawford was taken by IRA comrades in the internee huts at Long Kesh in June 1973 and hanged – lynched might be a more fitting word – with all the macabre and grisly ceremonial that accompanies such executions..."
This page was loaded Apr 22nd 2019, 11:00 pm GMT.